The technique is nothing new, of course, but I've been going through so many oranges lately that I thought I should learn how to make candied citrus peel. Verdict? Candied peel on its own is very nice -- sweet, chewy, slightly bitter, and would be a nice substitute for the awful candied fruit tossed into holiday fruitcakes. It could also be a gorgeous gift for someone if giving out homemade goods is your thing. But dipped in chocolate? Dark or perhaps even white? Oh, friend, now you're speaking my language. Because, rolled in sugar and then partly dipped in chocolate, the flavor falls somewhere between pâtes de fruits and a Jaffa Cake. But the good part of a Jaffa Cake, which, in my opinion, has always been the orange jelly filling and chocolate coating. As a kid, I would routinely scrape the top orange and chocolate layer off with my teeth and discard the dry biscuit. Insatiable sweet tooth and a basic lack of control in the presence of chocolate. I'm not proud of it. I grew up with those Jaffa Cakes and, consequently, still have a soft spot for them. Make no mistake: there is nothing nutritious about a Jaffa Cake. I don't even think the chocolate coating is real. It's probably some twisted conglomeration of sugar, milk fat, emulsifiers, and artificial food coloring. (If you've never had the pleasure, let me help you out). It's been years since I've actually had one of those cookies but the transcendent pairing of bitter chocolate and bright citrus is still a favorite. To be fair, this candied peel is not exactly a detox item either. But think of it as an occasional treat and a healthier update on mass market junk food. If that looks like an outrageous amount of sugar, it is, but you need it to create enough simple syrup to coat the orange peel. And you won't actually consume the entire quantity of sugar required. In fact, after candying the peel, you should have at least a cup and a half of orange-infused simple syrup remaining for use in cocktails (highly recommended, especially with citrus bitters). For what it's worth, there are some positive aspects, too. There is no artificial food coloring -- that cheerful orange color comes from the peel itself. No preservatives or other additives. As long as your sugar and chocolate are vegan and gluten-free, it's a vegan and gluten-free candy. (I used Florida Crystals Natural Cane Sugar -- it's vegan, organic, and allegedly "less processed"). Basically, if you use organic ingredients and good-quality dark chocolate, you could have something roughly approximating a healthy sweet. But very roughly. Enjoy the sugar and stay warm. Wash and dry the oranges and slice a 1/4" off the tops and bottoms. Then with the oranges positioned vertically, cut whole strips of peel peel off with a sharp knife, leaving about 1/4" of white pith attached to the peel. (Save the orange segments for snacking, salads, etc.). Slice the peel lengthwise into 1/4"-wide strips. Place the strips into a medium saucepan and cover with cold water. Bring to a boil and continue to boil for about one minute. Drain and repeat three more times to reduce the bitterness. (The more times you blanch the peel, the less bitter it will be). Set the peel aside while you prepare the simple syrup. In the same pan over medium heat, bring 1 cup of water and 1 1/2 cups of sugar to a boil, stirring often to dissolve the sugar. Reduce to a simmer and add the peel back into the pan. Simmer the peel for 45 minutes. Drain and reserve the syrup for use in cocktails and other recipes (store in the fridge for up to 1 week). Allow the peel to drain well -- for about 10 minutes or so -- and then roll it in sugar, carefully separating the strips. Lay the candied peel out on a baking sheet lined with wax paper or foil until completely dry -- this should take at least 4 to 5 hours but a full day is preferable. 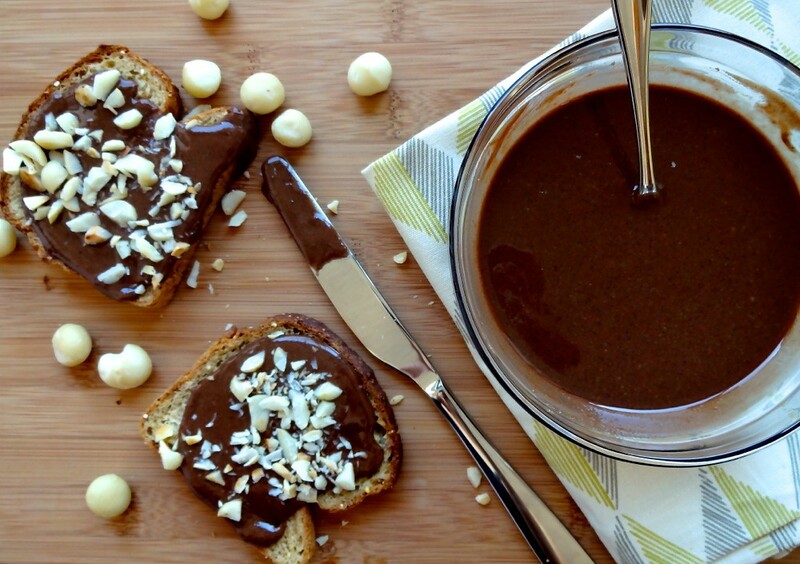 To dip in chocolate, simply heat up a few ounces of dark chocolate in a small bowl. Dip each strip halfway into the melted chocolate, gently shaking to remove excess chocolate, and lay it out to dry on a wire rack. After 15 to 20 minutes, transfer to a baking sheet lined with wax paper or foil to dry completely. Store at room temperature or in the fridge. Note: Be sure to let the candied peel drain well before you roll it in sugar to prevent clumps or soggy peel. 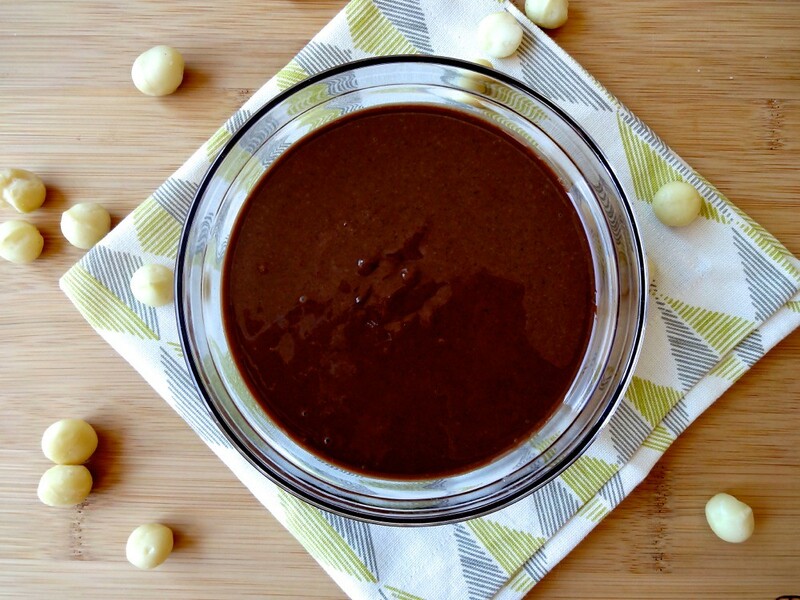 You can substitute white chocolate for the dark. Try this with lemon or grapefruit peel, too, but you may need to blanch the peel more times to get the bitterness out. For grapefruit, I would blanch five or six times. You can try to substitute alternative sugars but understand that brown sugar and coconut sugar may not candy the fruit properly and will almost certainly discolor the peel (speaking from my failed grapefruit peel/coconut sugar experiment). This post should surprise exactly no one. That I would, inevitably, combine gin and dark chocolate at some point was in the cards as soon as I started this blog and set aside a special place to experiment with gin bottles and food. That these ingredients would actually come together in such a delicious way is a bit of a revelation, though. Brooklyn Gin is a recent discovery, by the way. I first tried it at a cocktail bar over the summer and it has quickly become a favorite sipping gin. It also happens to have one of the most stunningly beautiful bottles I've ever seen. But feel free to use any gin or any other spirit you like -- a good bourbon or brandy would be a respectable second choice. For the less decadent and dissolute among you, leave out the alcohol and substitute fresh citrus juice, nut milk, or water. Sure I believe in healthy, clean eating. But I also firmly believe in treating yourself to occasional indulgences -- a balanced lifestyle is a lot easier to sustain over the long run than an overly restrictive one. Treat yourself kindly is my philosophy. And to be fair, aside from the (optional) chocolate coating and the inclusion of gin, these truffles are full of excellent, healthy ingredients as they primarily consist of dried fruit, nuts, and cacao powder. Prunes are a bit of an unsung hero, in my opinion, and I am determined to rehabilitate them with these chocolates. Dates are universally revered for their sweetness -- and rightfully so -- but prunes are almost unequivocally disliked. Their unpopularity resulted in an official (and utterly ridiculous) name change -- to "dried plums." It's more than a little unfair. Prunes have this awesome sweet and sour flavor; they're sweet and chewy but not cloyingly so. And they balance the alcohol and gin here far better than dates alone. More importantly, they're awesome from a nutritional standpoint: extremely high in antioxidants, a great source of vitamins A and K, and packed with dietary fiber (which you probably already know). Basically, what I'm saying is, prunes deserve some love, too. One final note before I set you free: these truffles are technically gluten free. The National Institutes of Health’s Celiac Disease Awareness Campaign has characterized distilled alcohol as safe for individuals on a gluten-free diet even though it may be derived from gluten-containing ingredients (the distillation process removes the gluten proteins). However, if you're extremely gluten intolerant, use your judgment. That's it. Now go treat yourselves. Toast the almonds by spreading them out on a sheet pan and roasting at 350 F for about 10 minutes. Or, toast the almonds in a large skillet over medium height until fragrant and lightly browned. Set them aside to cool for about 10 minutes. Toast the coconut in a skillet over low heat and watch it carefully. The fine coconut shreds can go from a beautiful golden brown to burnt in a matter of seconds. Add dates, prunes, almonds, and coconut to your food processor and pulse 10-15 times to break up the ingredients. Add in the cacao powder, vanilla extract, maple syrup, and pinch of sea salt, and process until the dough starts to come together. With the motor running, drizzle in 1 oz of gin and 1 tbsp water. Continue to process the mixture until the dough easily sticks together. (If it seems too crumbly, add in more water, a teaspoon at a time, until you reach the desired consistency). 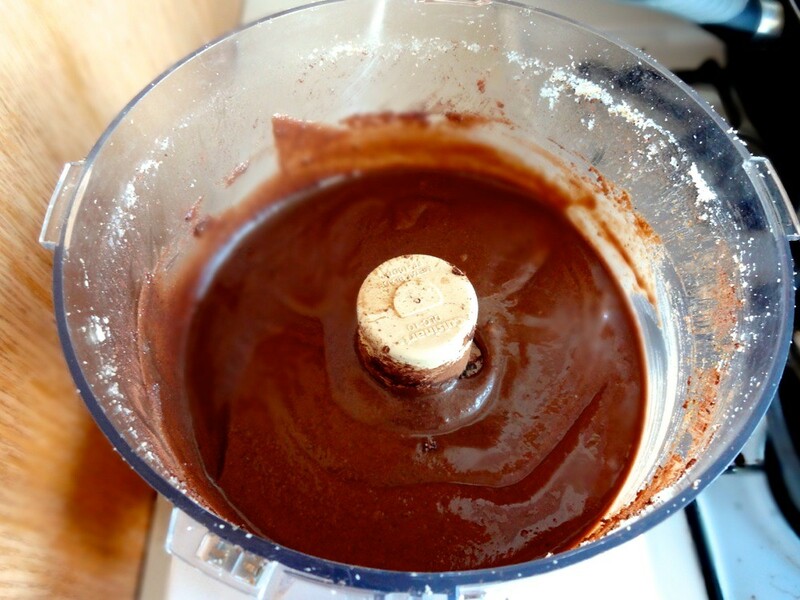 Move the mixture to a bowl and chill in the fridge for at least 30 minutes to set. Roll teaspoon-sized chunks of dough into little balls. Dip them into melted chocolate, set them on wax paper, and then place in the fridge for about an hour while the chocolate hardens. Alternatively, roll them in cacao powder. (They're also very delicious plain). Note: Again, I used Brooklyn Gin but you may substitute any other alcohol. For an alcohol-free truffle, use water, fresh orange juice, almond milk, coconut milk or coconut water. You can totally skip the roasting process above if you prefer to consume nuts/seeds in their raw state. *Recipe quantities edited March 16, 2014. I had previously posted a raw version of this nut butter recipe but I was never quite satisfied with it - the flavor was spot on but the texture was not at all what I had envisioned. Being an insane perfectionist, I could not let it rest. I threw out the old recipe and decided to use roasted nuts. Perhaps because my food processor is just not powerful enough to get the creamy, drippy, gooey texture that we all associate with a well-made nut butter, I found that I could only achieve this state of creamed perfection by roasting the nuts first. The roasting process brings out all of those great natural oils. Once the nuts were roasted, processing the ingredients into a creamy, chocolate consistency reminiscent of Nutella took no time at all. An added benefit of roasting beforehand is that there is no need to add any additional oil. This is an oil-free recipe, if that means anything to you. The enthusiasm with which some people (myself included) label recipes as "oil-free" always amuses me - because when you're home alone and eating nut butter (or something equally fattening) by the spoonful out of a jar instead of being productive, it's that extra 100 calories worth of oil that will push you over into excess. 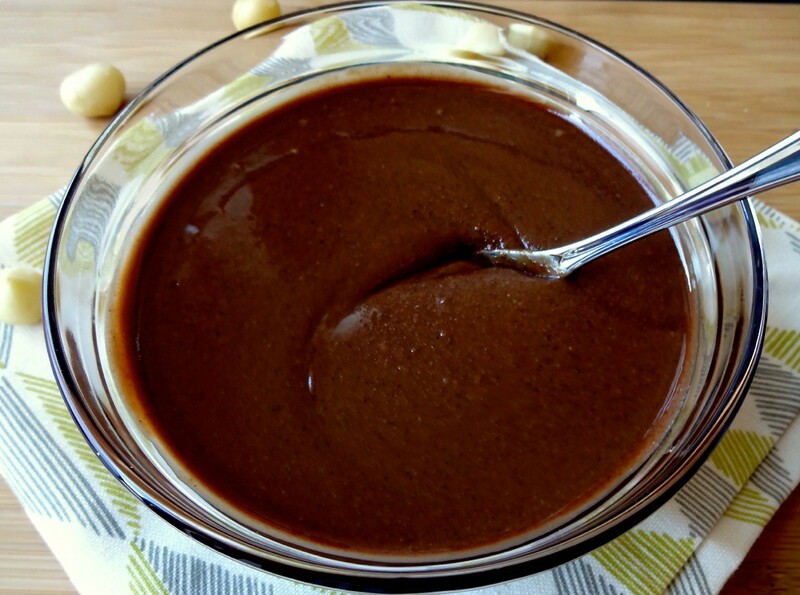 While raw nut butters are far healthier and I will continue to use them on a daily basis, this roasted macadamia version is a delicious occasional substitute. Even my selective, overly demanding perfectionism has been subdued by bitter, sweet, creamy spoonfuls of chocolate and espresso - at least for now. Serve it on gluten-free toast with more toasted macadamia nuts or sliced bananas, spread it on fresh warm crêpes instead of Nutella, use it as a dip for dried or fresh fruit, stir it into hot oats or quinoa, or just eat it by the spoonful (safe from anyone's judgment). Preheat the oven to 300 degrees F. Spread the macadamia nuts out on a baking sheet in an even layer and roast for about 10 to 15 minutes, checking the nuts halfway, until lightly browned. Allow the nuts to cool for about 10 to 15 minutes and then add them to your food processor. Pulse a few times to break them up. Process for about 5 minutes until the mixture becomes creamy and buttery, scraping down the sides as needed. Add the cacao powder, espresso powder, coconut sugar, vanilla, and sea salt and continue to process for 3 to 5 more minutes until the butter is perfectly creamy. 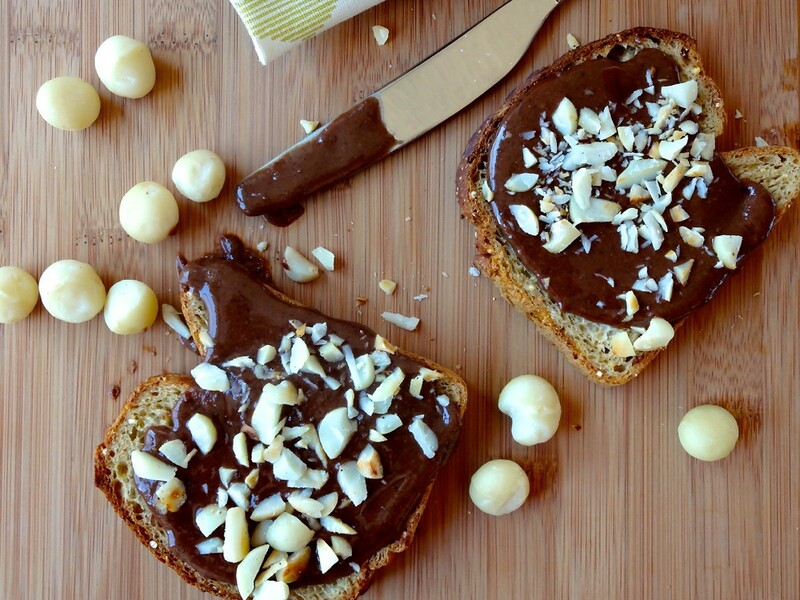 The nut butter can be served right away or stored in the refrigerator for up to 1 week. For long-term storage, freeze for up to 1 month. Notes: I used coconut palm sugar as a sweetener in this recipe but you can definitely substitute an equal amount of another natural sweetener. I've been curious about coconut palm sugar for some time now - there is a lot of debate about whether or not it's as healthy as everyone claims or whether it's simply another overhyped product (see our recent history with agave). I do like it here for its intensely sweet, caramel flavor as it works well with the bitter espresso, the rich cacao, and the roasted nuts. Feel free to substitute a different sweetener. There is a new Grizzly Bear track out and it's kind of lovely.